Welcome to Cooking With Cricut’s very special SURPRISE “Thank You” Blog Hop. Why is it so special? There are a couple of reasons! The first reason -- it is our 100th Cooking With Cricut challenge and the second (and most important) is to thank our wonderful leader and “Executive Chef” Melinda Beltran. Melin started the Cooking With Cricut challenges in October 2010 to encourage crafters to find new and different ways to use their Cricut cartridges. And she has accomplished that and so much more! 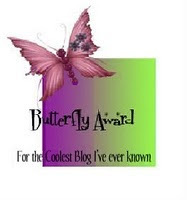 She has given scores of crafters a place on her Design Teams which quickly turned into a sisterhood of women, who care for each other; who encourage each other; who lift each other and their families up in prayer; and who have shared their hearts and their art through many outreach projects. head back to Cooking With Cricut – you won’t want to miss any of these awesome cards!! Today's my last post as a Designer for Cooking with Cricut. My paper crafting is shifting focus away from Cricut and I felt it was time to pass on the reins. It has been a lot of fun this past year and I have really enjoyed everyone on the team. Please continue to follow me, and see where my crafting goes next. Black & White – use black and white and a small amount of kraft/neutral paper. For today's card, I used a kraft base, and a black background. 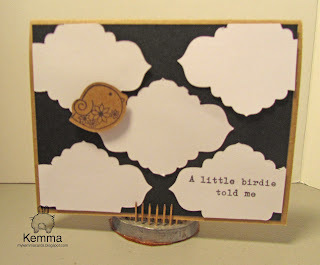 I cut out the little cloud type shapes with CTMH Art Philosophy cartridge. The bird is a die from Papertrey Ink with matching stamps called Tweet Talk which I cut out of craft and stamped with True Black and raised with a pop dot. Inside the card it says "it's your birthday" in black. Simple but fun! I donated this card to Madison's I feel the love campaign. Thanks so much for hopping with us. We hope you’ll join us and leave your own “thank you” in the comment section for Melin at CWC! Now it’s time to head on over to Court – she’s the next stop on this party train! Been a bit since I posted. Had two weeks in hot and sunny PA for vacation and the pre and post vacation activities have really taken up the time. 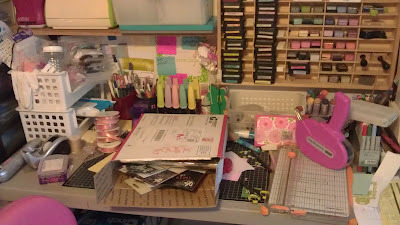 There are still remnants of the PaperTrey Ink Stamp-a-Faire activities on my desk...I need to clean that up. Not much going on right now with paper crafting, though I got this lovely box in the mail when I returned full of Pink Paislee stuff, so much happier with this grab box than the one I got last time from another company. 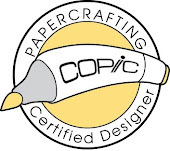 Another thing of note, they are having Copic certification classes near here in October and I have signed up! Should be lots of fun!